As always, the 2019 Attorney’s Daily Diary is useful and user-friendly. It’s as elegant and handy as ever, with a sturdy but flexible binding that allows your Diary to lie flat easily. 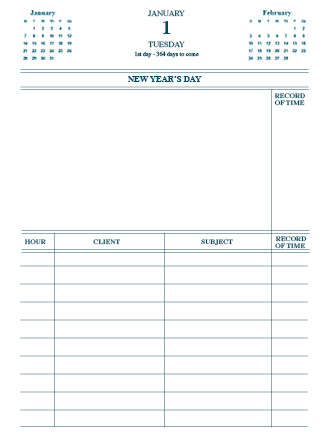 The 2019 Diary contains several pages of useful information, month-at-a-glance pages, ample telephone and address space, and a printed tab at the beginning of each month. The Diary is especially prepared for Illinois lawyers and as always, allows you to keep accurate records of appointments and billable hours. It also contains information about Illinois courts, the Illinois State Bar Association, and other useful information. View a sample page below. Actual page size is 57/8 by 8"